Transparency Market Research (TMR) predicts that the global veterinary drugs market has a highly consolidative vendor landscape. In 2015, the top ten companies operating in the global veterinary drugs market held a share of more than 70% of the total share. Some of the key players operating in the market are Elanco Animal Health, Merck Animal Health, Zoetis Inc., Bayer Animal Health, and Merial Animal Health. 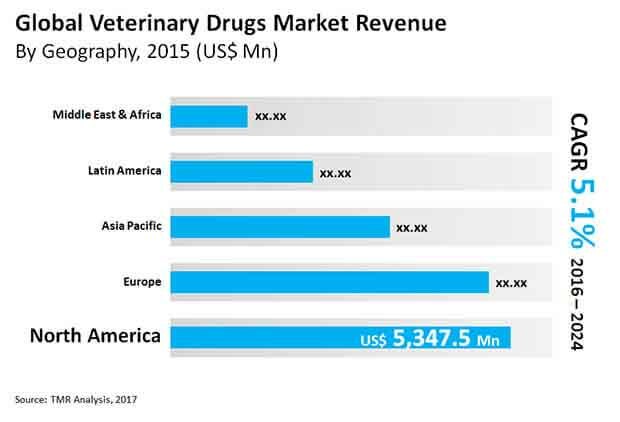 According to TMR, the global veterinary drugs market is expected to expand at a CAGR of 5.10% over the forecast period to reach a value of US$26.7 bn by 2024-end. The market had acquired a value of US$17.2 bn in 2015. Based on the animal type, in 2015, the companion animals segment led the global market and is expected to stay in the comparable position in the following couple of years. Based on the region, North America is anticipated to encounter a high development in the following couple of years. The high development of this section can be ascribed to the developing interest for excellent protein and poultry meat. Then again, the sidekick creature portion is anticipated to enlist a promising development rate in the coming couple of years. The developing medicinal services use and the expanding pet possession are the key factors that are anticipated to support the development of the fragment in the following couple of years. The rising ubiquity of an assortment of buddy creatures and the developing interest for a few meat items are considered as the key factors that are foreseen to empower the development of the worldwide veterinary drugs market in the following couple of years. Moreover, the developing extra cash of purchasers, particularly in creating economies has additionally permitted a huge ascent in the consumption on creature care, which is probably going to quicken the development of the general market sooner rather than later. Then again, the section of new items in the veterinary drugs market has brought about a danger of fake items, accordingly confining the development of the worldwide market in the following couple of years. Additionally, the developing mindfulness among individuals in regards to the unfavorable impacts of a portion of the veterinary drugs on human is likewise assessed to diminish the general development of the market soon. Crosswise over created nations the responsibility for or domesticated animals creatures of different known and extraordinary breeds has stayed high since the most recent couple of decades. Creating nations are getting up to speed in such manner also. Over the world, animals creatures are significantly trained for their monetary esteem. Dairy items, meat, filaments, and manures got from sidekick creatures have significant market esteem. What's more, their work is put to use in horticulture and cultivating. Other than this, people have become partial to petting partner creatures. Impelled by these components the interest for veterinary drugs has expanded as veterinarians and proprietors center more around guaranteeing the wellbeing and health of sidekick pets. While the market keeps reeling under danger from the accessibility of low quality fake items, the developing reasonableness of veterinary drugs will keep their interest pacing higher in the coming years.